The new restaurant brings cepelinai, honey cake, and other hard-to-find specialties to Alameda. Stuffed cabbage rolls, filled mostly with meat, were our favorite entrée. I can't recall how it came to be that, as a not-particularly-worldly Asian-American kid growing up in the New Jersey suburbs, I started eating Polish pierogi as my after-school snack. But maybe it helps explain why I've developed such a fondness for Eastern European food over the years — for smoked sausages, cold beetroot borscht, and the region's entire taxonomy of potato-filled treats. Not that I eat the stuff often, given how underrepresented those cuisines are in the East Bay. So it was with excitement that I visited Alameda's new Mama Papa Lithuania Restaurant and Tea House — the only Lithuanian restaurant on the West Coast, according to owner Vaidas Sukys. Certainly, this is the only Bay Area restaurant where you can eat Lithuanian-style potato dumplings, drink Svyturys lager, and end your meal with a layered honey cake known as medutis. On the whole, the place is arguably the quaintest, most charming little restaurant in an island city whose identity — gastronomically speaking — is defined by quaint, charming little restaurants. Sukys, who often works the front of the house solo, talks to customers about the menu with such enthusiasm that it's easy to be won over. And if the most common reaction to the food is that it tastes like someone's mom's home cooking, that's because it is — literally: Sukys' mother, Damute Sukiene, is the chef (and "Mama"), and, as her son tells it, she prepares all of the dishes on the menu the same way she would do it at home. Which isn't to say that Sukiene is an amateur: In the Nineties, she opened a bakery in Lithuania and later went on to cook at restaurants in Iceland and London. But Sukys dreamed of having a restaurant of his own, where his mother could serve her traditional, home-style Lithuanian dishes. 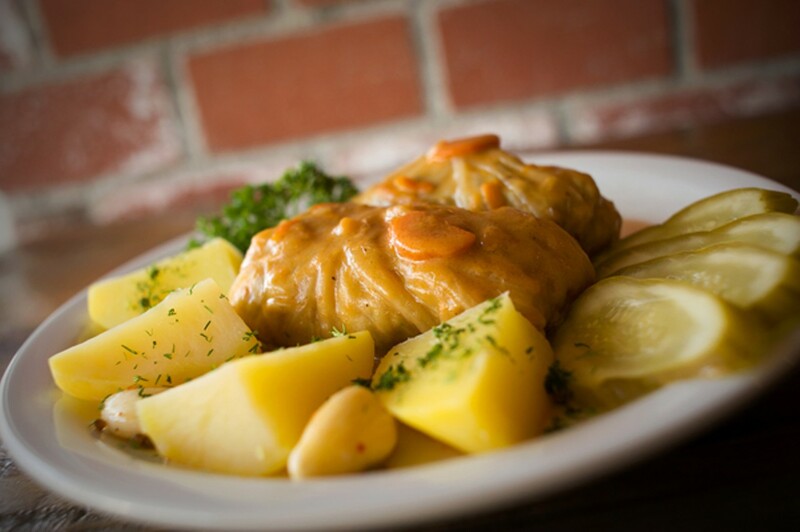 He said when he started toying with the idea of doing it in Alameda, where he lives, his Lithuanian friends laughed at him, unconvinced that Americans would want to eat cold borscht or potato dumplings. "I basically killed that myth," Sukys said. "Even the local Alamedans, they love potato dumplings." And it's true that during each of my visits, the dining room was filled almost to capacity. 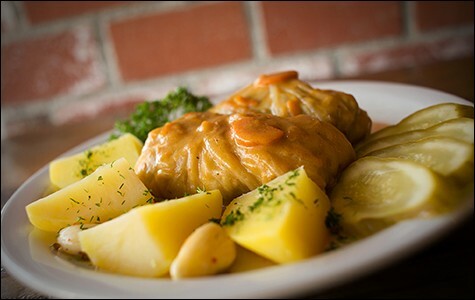 Those dumplings, or cepelinai, are probably Lithuania's most famous dish, named such because of their resemblance to the Zeppelin airships of the early 20th century. Mama Papa's version consisted of two enormous blimp-shaped things sitting atop a pool of creamy mushroom gravy. Unlike with, say, pierogies, here, the potatoes formed the "wrapper" (not the filling) of the dumpling — a thick, sticky layer of dough (made by combining cooked potatoes and freshly prepared potato starch) whose texture reminded me of those fried glutinous dumplings served at dim sum houses. Each boiled cepelinas was filled with ground pork seasoned with black pepper, minced onion, and other spices. It's an awfully starch-heavy dish, and while I wouldn't go out of my way to order it again, I could see its homey appeal. My favorite entrée was a plate of stuffed cabbage rolls, one of a handful of rotating off-menu specials. It seems like every Eastern European cuisine has its own take on this dish, but Sukiene's version was one of the best I've had. The rolls were mostly meat (more of that seasoned pork), wrapped in a thin layer of cabbage and served in a savory red-orange sauce made by slowly simmering the cabbage's cooking liquid. Completing the plate were boiled potatoes, thick slices of pickled cucumber, and whole cloves of crunchy pickled garlic — a real hit to the sinuses. The only dish I actively disliked was another special: a boneless chicken thigh covered in stretchy melted cheese, which reminded me too much of a poor man's chicken cordon bleu. Since the entrées tend to be heavy, it's nice that Mama Papa Lithuania offers simple soups and salads to start your meal. The cucumber salad — slices of cold, very crunchy cucumber smothered in a mild yogurt sauce — won't win awards for innovation, but would be an especially nice, light way to start a meal on a hot day. The cream of mushroom soup was much better and more intensely mushroom-y than Campbell's. And, for diners who are only familiar with cold borscht, the red borscht with mushrooms — savory, well balanced, and loaded with vegetables — is well worth a try. Both soups came with a slice of dark, intensely fragrant, cake-like Lithuanian rye bread, which the restaurant imports. Finally, you'll want to save room for dessert — or plan a separate afternoon trip, perhaps with your laptop in tow (free wifi, FYI). Mama Papa offers a wide selection of excellent herbal teas, also imported from Lithuania. (According to Sukys, his countrymen's Baltic ancestors were "masters of herbalistic processes.") And while there was only one dessert on offer during my visits, it was impressive indeed: Sukiene's honey cake, or medutis, is made up of seven delicate layers and resembles a fancy carrot cake, with a tangy sour-cream filling. Each thin cake layer is infused with the flavor of roasted honey — a subtle, smoky sweetness that lingers in your mouth.